It's finally finished, and that means, I finally get to show it to you. 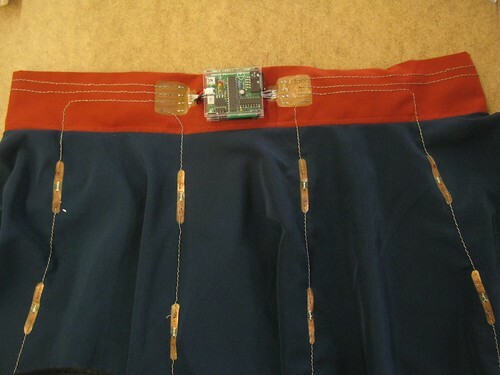 The NorthSkirt is a soft circuit project that incorporates my redesigned flexible soft-circuit boards (now, StarBoards), a hacked NorthPaw kit, and a strong desire to have a soft-circuit project actually DO something. What does it do? It points north, silly. I wanted to use the flexible circuits from the previous post in a project for Maker Faire. I decided to modify the components from a NorthPaw kit, made by pal and fellow Noisebridger Eric Boyd. 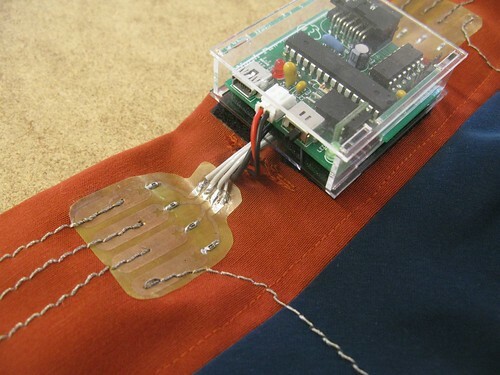 It's an anklet that senses north and turns on one of the 8 motors around the anklet, indicating north. 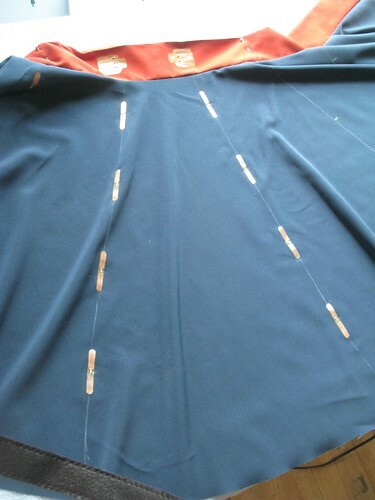 I then made a simple circuit skirt, and carefully laid out the lines that the traces would follow. I wanted the circuits themselves to be aesthetically pleasing. After much fussing, I decided on 8 rows of 4 LEDs each. At 1.8 volts per LED, a simple modification to the board would allow the lights to be powered by a 9v battery. Check out the new design for StarBoards. The board itself uses a hm55b compass chip from Paralax. 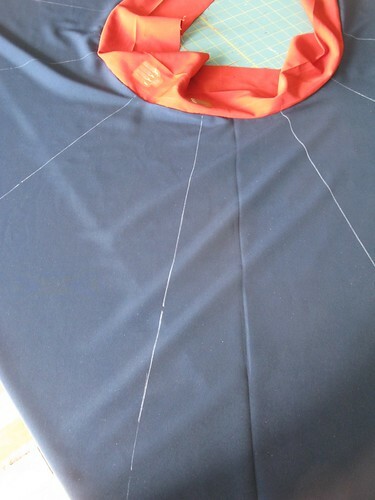 ..and then sew through. 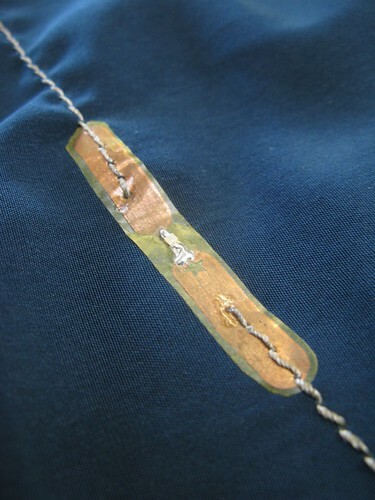 The conductive thread is way easier to work with this way- the stitches make a reliable, strong connection with the board and a lock stitch holds the finicky thread in place. The star on StarBoards denotes positive. 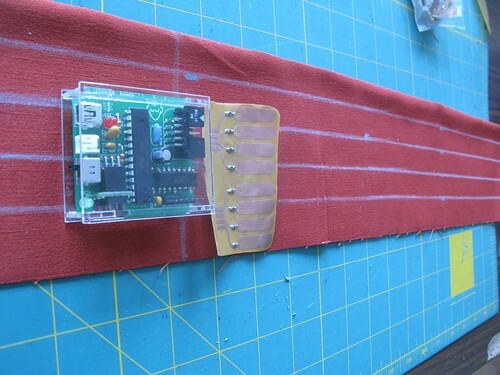 The boards were pre-soldered, but the Kapton (high temperature tape) substrate means that soldering/repairs can be done without damaging the fabric. The waistband. The board itself is powered by SparkFun's 3.7v LiPo- which, along with the 9v powering the LEDs, is hidden in the waistband. The whole board is fully detachable for washing purposes. On the subject of washing. In theory, the whole thing- once the board removed- is washable. One of the great things about skirts is they don't as dirty as fast as say, pants or shirts. When it comes time to wash this one, I'm going to wash it, gently, by hand, and let it air dry. Breakout board close-up. you can see where the lines to the battery enter the waistband. 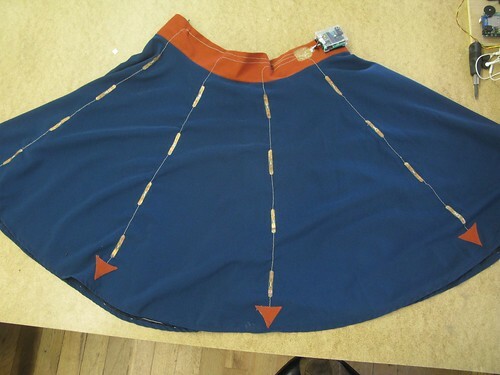 The color scheme of the skirt is one of my favorites, and somewhat western-wear inspired. I added triangle accents at the bottom of the LED rows for added flourish- but they're also functional. That's where the conductive thread switches from outside to inside, where it meets the shared power line (the selection of lines happens on a selective ground principle). When I turn, the compass chip lights the appropriate row of LEDs- the row facing north. It's constantly on, and can change faster than I can spin. Consequently, I spend most of Maker Faire dizzy and nauseated. Worth it, though. Tada! 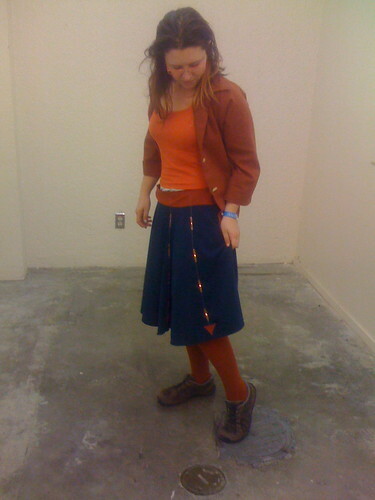 the finished skirt, worn by me, at Maker Faire. I had the pleasure of showing the skirt both in the Fashioning Technology fashion show as well as the Anti-surveillance show. All these photos and more can be seen on my flickr. Stay tuned for my next post- I can't wait to tell you what's next for StarBoards!